Search "room in an bag" 34 results have been found. 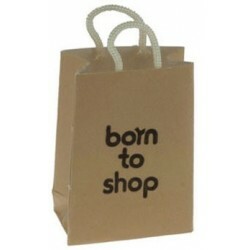 Redecorate and redesign your dollhouse with this Shopping Bag. Your decor and collection of miniatures will be taken to another level of fabulosity. You will love this Red Lace Room in a Bag - Designer Bedroom as it complements your other miniature dollhouse furnishings. Now is the time to design a great new look! 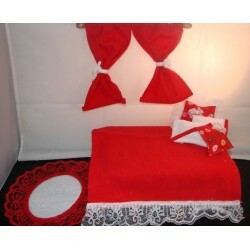 Red Lace Pattern Bedspread w/ Curtians, Lace Rug, 2 (red) Bowtie Pillows, and 2 (white) Accent Pillows. 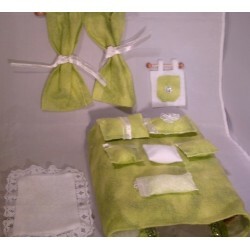 Adding this Green Frost Room In A Bag- Designer Bedroom to your miniature collection is just what you need to make your dollhouse a home, and showcase your fabulous taste. Green Frost Pattern Bedspread w/ Curtians, Jeweled Rug, Jeweled Wall Tapastry, Accent Pillows (Green & White), Flower Pillow, and Green Frost Pillows. 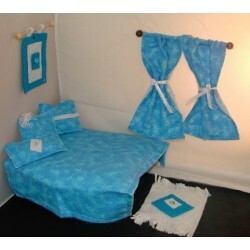 You will love this Blue Frost Room In A Bag- Designer Bedroom as it complements your other miniature dollhouse furnishings. Now is the time to design a great new look! Blue Frost Pattern Bedspread w/ Curtains, Jeweled Wall Tapastry, Jewel Frayed Rug, Assorted Blue Frost Pillows, and a Blue Frost Body Pillow. Adding this Pink Leopard Room In A Bag- Designer Bedroom to your miniature collection is just what you need to make your dollhouse a home, and showcase your fabulous taste. Pink Leopard Pattern Bedspread w/ Curtains, Jeweled Wall Tapastry, Jeweled Rug, Bed Pillows, Body Pillows, and an Accent Pillow. You will love this Zebra Stripe Room In A Bag- Designer Bathroom as it complements your other miniature dollhouse furnishings. Now is the time to design a great new look! 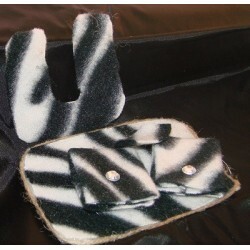 Zebra Stripe Pattern Bath Rug, Toilet Rug, Toilet Lid Cover, and Jeweled Accent Towels. 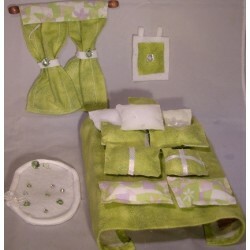 Enhance your dollhouse collection with this Green Polka Dot Room In A Bag- Designer Bathroom. Added to your other dollhouse miniatures, it is a complement for a variety of styles and tastes. 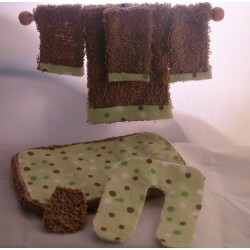 Green Polka Dot Bath Rug, Toilet Rug, Terry Cloth Toilet Lid Cover and Accent Towels w/ Rack. You will love this Orange Lace Room In A Bag- Designer Bathroom as it complements your other miniature dollhouse furnishings. Now is the time to design a great new look! Orange Oval Lave Bath Rug, Toilet Rug, Toilet Lid Cover, and Jeweled Accent Towels. Adding this Black Jewel Room In A Bag- Designer Bathroom to your miniature collection is just what you need to make your dollhouse a home, and showcase your fabulous taste. 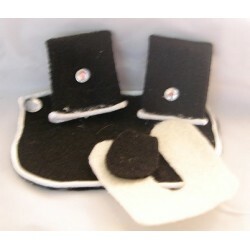 Black Jeweled Bath Rug, Toilet Lid Cover, (white) Toilet Rug, and Jeweled Towels. You will love this Solid Red Room In A Bag- Designer Bathroom as it complements your other miniature dollhouse furnishings. Now is the time to design a great new look! 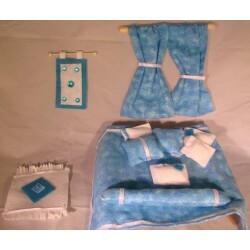 Red Bath Rug, Toilet Rug, Toilet Lid Cover, (white) Bathrobe, and a Jeweled Towel. Adding this Zebra Stripe Room In A Bag- Designer Bedroom to your miniature collection is just what you need to make your dollhouse a home, and showcase your fabulous taste. Zebra Stripe Pattern Bedspread w/ Curtains, Rug, Black Pillows, and Black and White Accent Pillows. 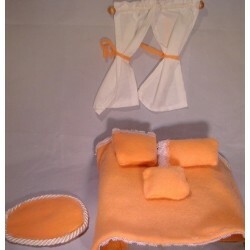 Enhance your dollhouse collection with this Salmon Room In A Bag- Designer Bedroom. Added to your other dollhouse miniatures, it is a complement for a variety of styles and tastes. Salmon Pattern Bedspread w/ Curtains, Oval Rug, Pillows (Salmon). 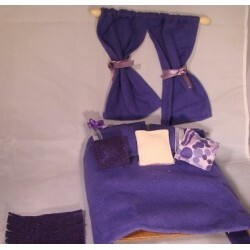 You will love this Purple Room In A Bag- Designer Bedroom as it complements your other miniature dollhouse furnishings. Now is the time to design a great new look! Purple Pattern Bedspread w/Curtains, Frayed Rug, Pillows, and Accent Pillows. Green Frost Bedspread w/ Curtains, Flower Rug, 1 Jewel Wall Tapastry, Green Frost Pillows, Flower Pillow, Accent Pillows(Green & White). You will love this Zebra Stripe Room In A Bag- Designer Bedroom as it complements your other miniature dollhouse furnishings. Now is the time to design a great new look! 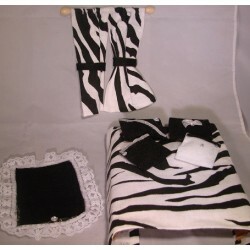 Zebra Stripe Patern Bedspread w/ Curtains, Rug, Jeweled Pillows, and a Bowtie Pillow. Green Frost Pattern Bedspread w/ Flower Curtains, 1 Jewel Wall Tapastry, Flower Pillows, Accent Pillows(white), Green Frost Pillows, and 1 Jewel Rug (white). Spruce up your dollhouse with this miniature Pink Leopard Room In A Bag- Designer Bedroom. We have many miniature accessories for that finishing touch. Pink Leopard Bedspread w/ Curtains, 1 Jewel Frayed Rug, 1 Jewel Wall Tapastry, and a Pillow.